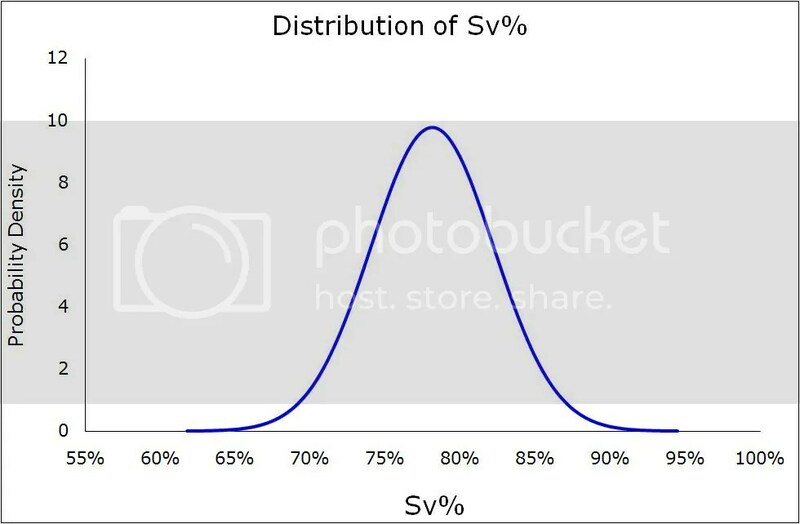 I’m going to approach save percentage in a similar way to how I’ve started looking at shooting percentage. 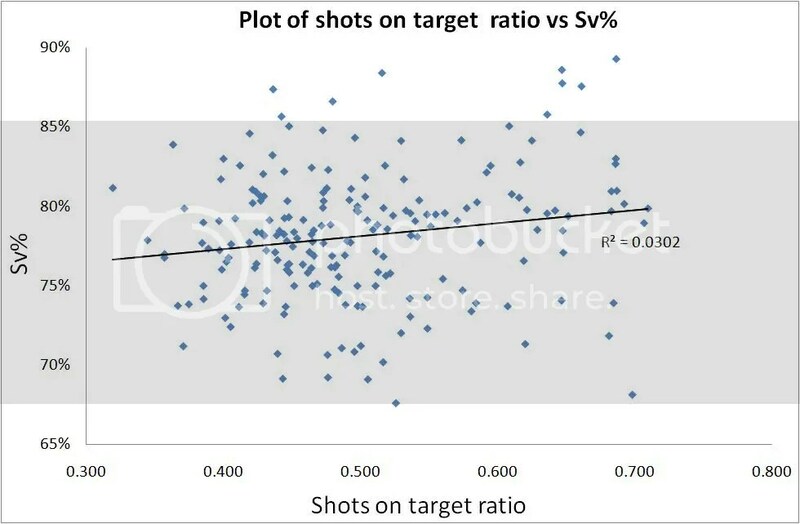 Again I’ve plotted the team save percentage versus their shots on target ratio (SOTR) to determine whether better teams save a larger proportion of shots. There’s the same trend here as for shooting percentage, better teams do have a slightly better save percentage but the correlation is so poor it’s essentially a random effect. Again there’s a relatively wide spread. Whilst the average save percentage is 78.14% roughly 3 teams a year are expected to save less than 74.06% of shots on target (one standard deviation below the mean) and roughly three more teams save more than 82.22% of shots on target (one standard deviation above the mean). So again lets look at the effect of this on an average preimership team. This time is a little smaller than the range of shooting percentage at 9.2 goals (approximately 6 points). Again it’s easy to imagine a situation at the bottom of the league, where teams face a higher volume of shots on target against, where a team could be relegated courtesy of a poor save percentage. And finally is the ten best and worst team seasons in terms of save percentage. So there we have it. Better teams do have marginally better shooting and save percentages but trying to pick which teams will ezhibit these in a given year is next to impossible. Next I’ll go on to look at whether shooting and save percentage are random or if similar values persist for each team over consecutive seasons.